Though his operation still doesn't have a brick-and-mortar location, chef Ryan Farr has established himself as one of the city's most respected butchers and meat mavens. 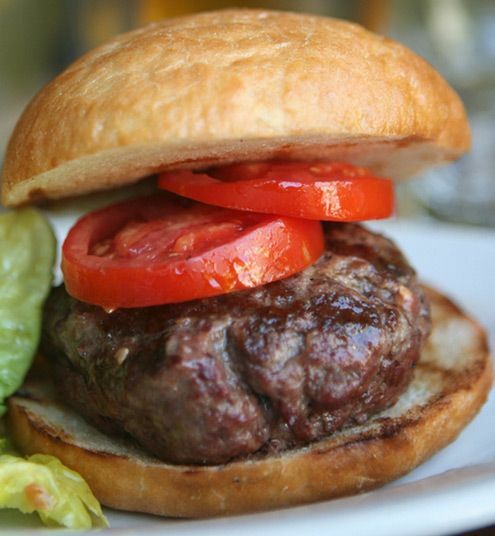 His burger remains one of our favorites for its rich beefy flavor and simplicity. It's made with Magruder Ranch grass-fed beef, and comes on a homemade scallion-sesame bun with gruyere and special sauce. 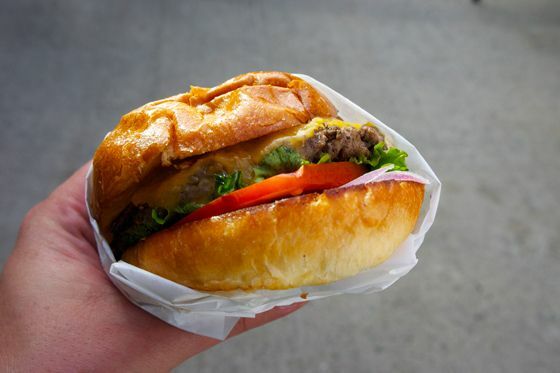 You can find 4505 Meats slinging awesome burgers and sausages at the Ferry Building at both the Tuesday and Saturday farmers' markets. Chef Adam Keough updated and refreshed the menu when he took over at Absinthe in 2011, but with the popular burger he only made a few improvements. 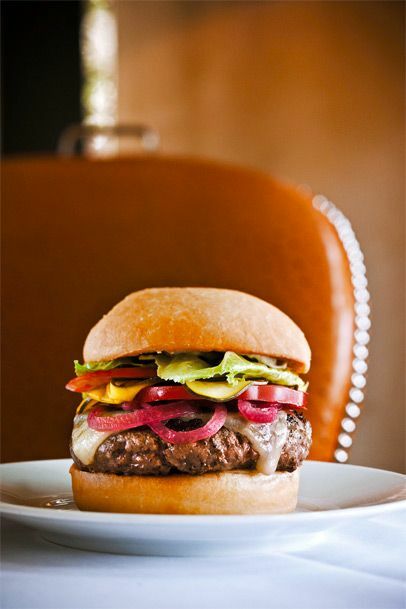 It features a juicy Storm Hill Angus beef patty, house aioli, baby lettuces, red onion, and house-made pickles. 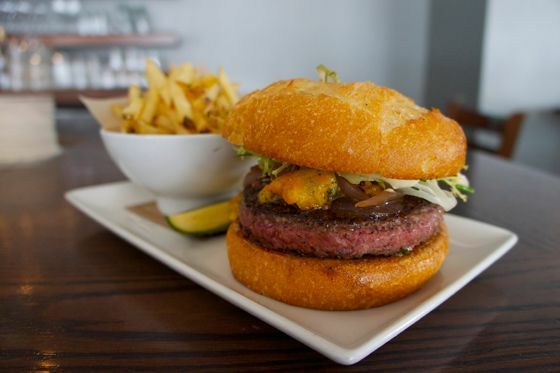 The Balboa burger, always served on a baguette, has been a Marina go-to since the eighties, and remained so after Billy Getty and Gavin Newsom took the historic saloon over in the mid-90s. (Michael Bauer says it's just as good today as it was in 1989 when he was still a rookie critic at the Chron.) 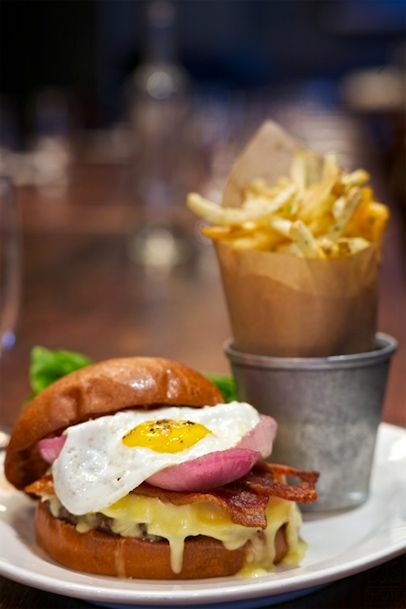 It still features an all-natural chuck patty, housemade pickles, and pickled onions. And they sell 50,000 of them a year, give or take. 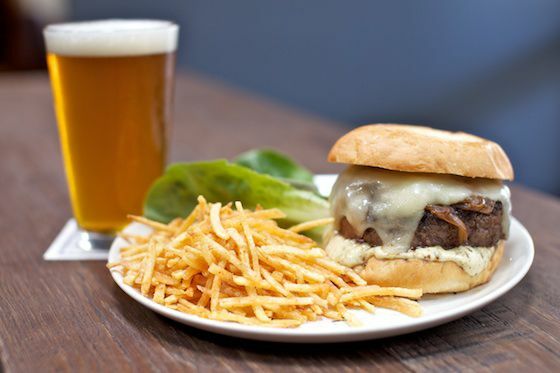 Jessica Boncutter makes her plump burger, which is ever-popular with the regulars in Hayes Valley, with Marin Sun Farms beef, and tops it (optionally) with both Point Reyes blue cheese and gruyère, as well as fresh tomatoes. 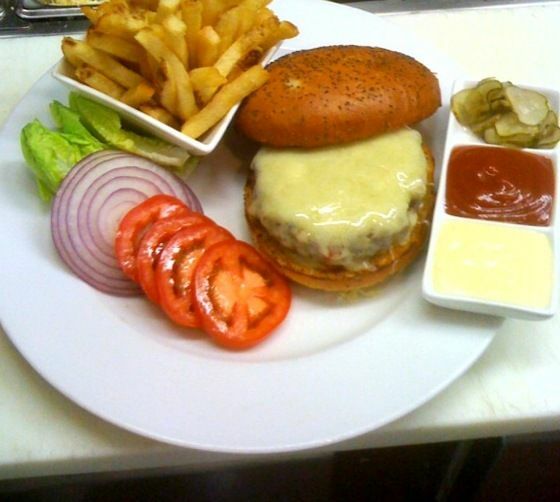 Be aware, though, that you'll only find the burger on the dinner menu on Tuesdays and on the weekend. 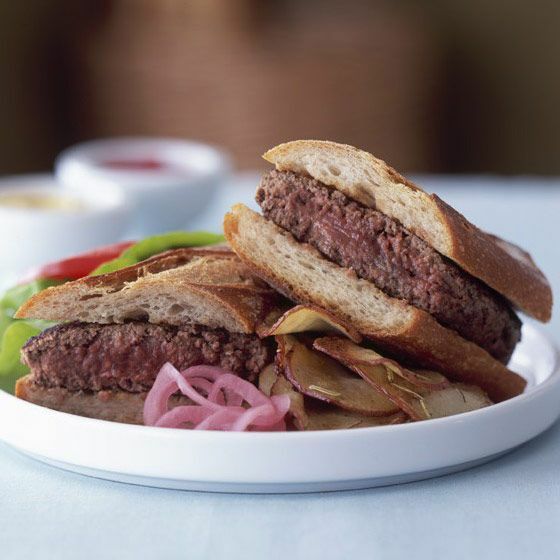 The key to the Bix burger is that it's cast-iron seared using a patented grill press (available from Williams-Sonoma) invented by chef Bruce Hill. It's all-natural chuck from Creekstone Farms with 20 percent fat, served simply with aioli, ketchup, and pickles. 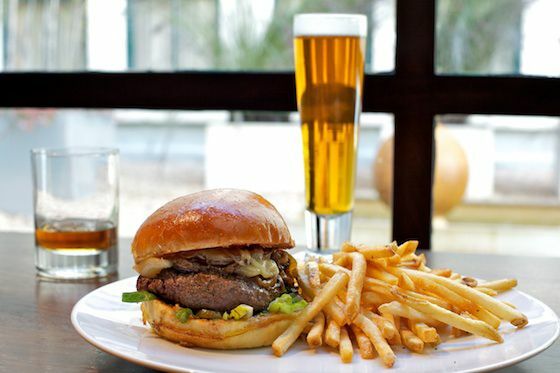 The burger at Michael Mina's steakhouse at the St. Francis is a hand-ground whopper (in the original sense of the word) featuring Nicasio Valley cheese and caramelized onions. It is, in fact, worth the price tag if only for the fantastic beef flavor and texture. It tastes like everything beef should be, and often isn't, and it satisfies our most powerful burger cravings. 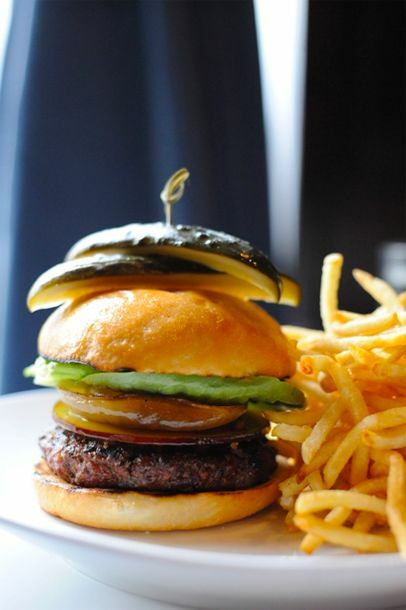 Hubert Keller may serve one of the most overpriced burgers in town, now called the Remixed Rossini Burger (minus the foie gras, plus some lobster, and it's still $60), but Burger Bar remains a solid burger option for those trapped at Union Square. We're especially fans of the sliders — you get one each of buffalo, Angus, and "country natural" chuck patties, one with bacon, one with caramelized onions, and one plain with American cheese. This newish Haight Street burger depot makes a reliably good and well cooked burger. Our pick of the bunch on the menu is the Steakhouse Burger, medium rare, with horseradish sauce, mushrooms, and sautéed onions. 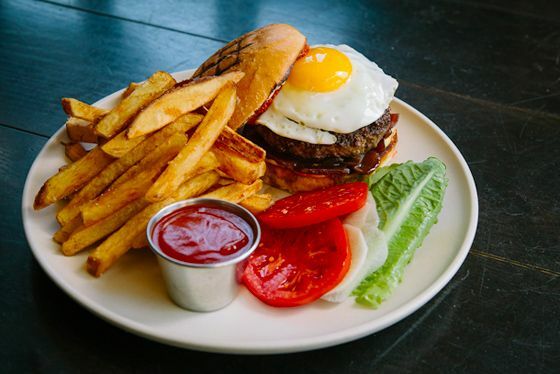 While Burger Bar might win out for sheer variety, this burger on the other side of Union Square, only on Burritt Tavern's lunch menu, is nonetheless impressive and delicious. It's topped with aged cheddar, horseradish aioli, and applewood smoked bacon. 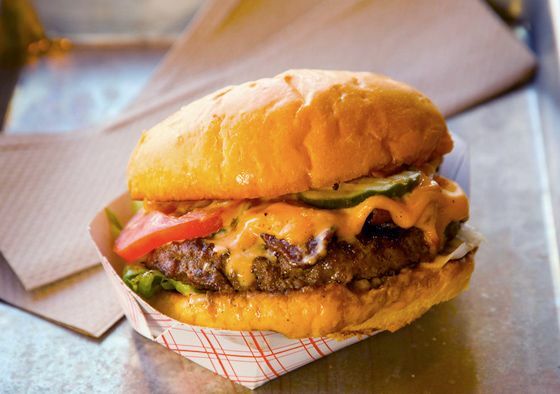 Chef Chris Beerman's big, sloppy burger at this SoMa spot is the perfect hangover remedy. He makes it with Snake River Farms Kobe beef and tops with roasted garlic mayo, roasted tomato, and house-made pickles. If you want it with the works (pictured), you'll also get guacamole, bacon, and a fried egg. Also, the challah bun from next-door bakery Pinkie's doesn't hurt. 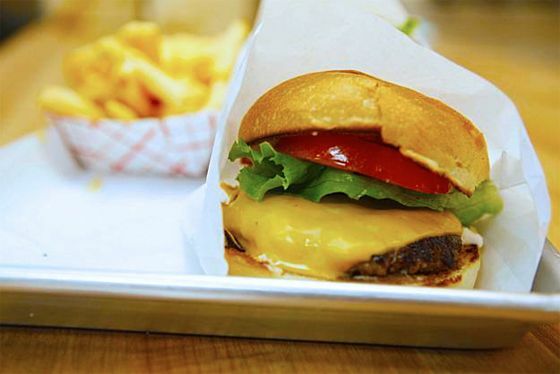 Tops among food-truck burgers, in our opinion, is Docs of the Bay, which makes a humble but delicious one with special sauce, American cheese, pickles, lettuce, and tomato on a nice challah bun. You can also top it with some of their terrific house-made ketchup made with red bell peppers, which also pairs well with their seasoned fries. Another humble but excellent burger can be found for well under $10 at Double Decker, a tiny little burger stand attached to a motel on Grove Street near Gough. Our favorite (pictured) is a somewhat original concoction called the Buffalo Burger, which has spicy-tangy buffalo sauce for a condiment. It's so good we're kind of surprised we never saw one like it before. This bar, with a name taken from the Muppets house band, makes a serviceable slider (we especially like the meatball-parmesan one). 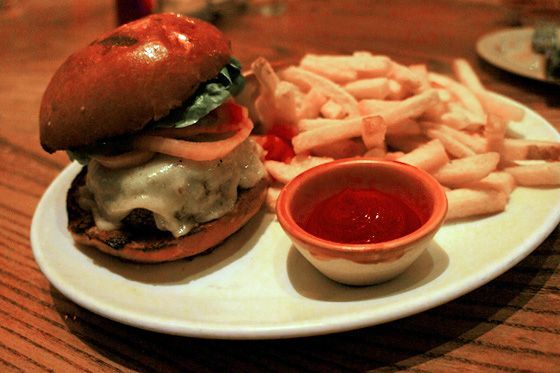 But they also boast the spiciest burger in the Mission, the Death Burger (pictured). It's topped with habanero "death" sauce, as well as Jack cheese, chipotle mayo, and jalapenos. Your digestive tract will not like you afterwards, but seeing as it comes with a waiver you must sign before consuming it, it does come with some bragging rights. For the depth of beef flavor, Epic Roasthouse's burger is near the top of our list around town, albeit with one of the highest pricetags. They use a half pound of meat from Schmidt's Ranch in Sebastopol for each burger, and it's ground in-house giving it extra texture and heft. Chef Jan Birnbaum tops this beauty with red wine-marinated onions and anchovy ketchup for a bonus blast of umami. A damn fine specimen. Fifth Floor is far more than your average hotel restaurant, and the burger, which can be had at the bar any evening along with a shot and a beer for $25, is far better than average. It's topped with bourbon onions and pungent Comté cheese, and it's served on a fresh bun from Oakland's Firebrand Artisanal Breads. 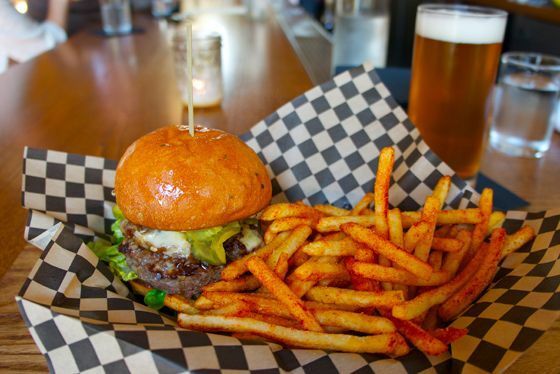 A relative newcomer on the food truck scene, Oakland-based Five Ten Burger (get it? 510?) 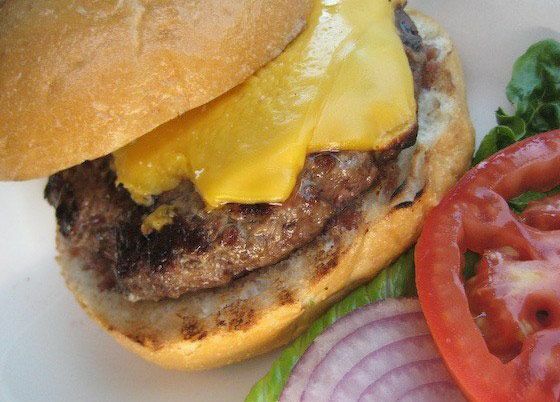 makes a delicious, juicy burger that stands right up there with In-N-Out and Docs of the Bay. 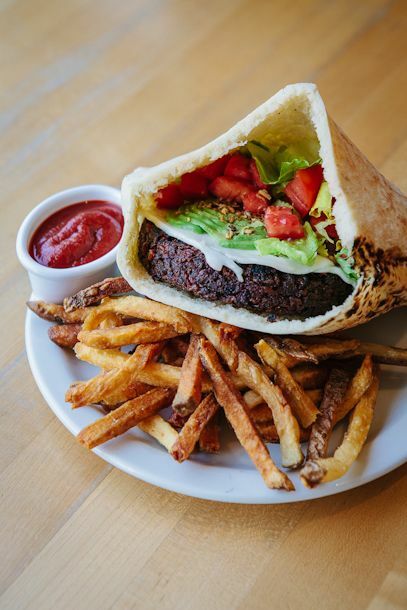 It's solid and unadorned, and you can choose between a natural, grain-fed beef patty from Golden Gate Meat Co., or a grass-fed organic patty from Eel River for two bucks more. The only Berkeley burger that made our list (sorry, 900 Grayson) is the one chef Sean Baker has been serving at Gather for a couple of years now. It's got the local/organic pedigree with beef from Prather Ranch, and it's topped with Sierra Nevada cheddar, onion compote, and garlic aioli. It's a gooey, drippy, extra-juicy specimen, and it brings us back to Gather almost as much as the decidedly non-carniverous vegan charcuterie. It may not be called Taylor's Refresher anymore (there was a little trademark kerfuffle), but the burger remains ever the same, and damn good. It is vaguely In-N-Out-esque but crumblier, with a Niman Ranch patty topped with American cheese and "secret" sauce, and it's modest in size. The popularity of this burger has kept this place packed since pretty much Day One at the Ferry Building, and with good reason. We're alarmed to find that it's not so easy to find a decent patty melt these days. 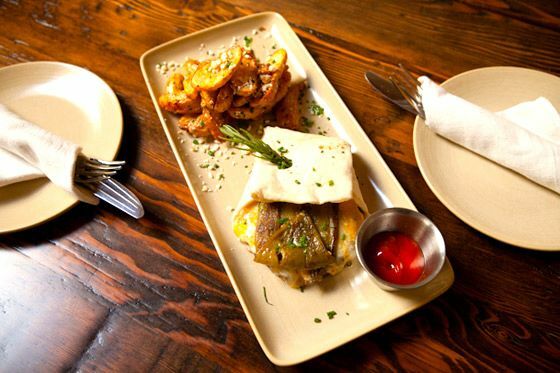 The one they do at The Grubstake, among all their diner-style, served-until-4-a.m. burger offerings, is as fine an example as we've found, with liberally greased, griddle-crisped rye bread, caramelized onions, and a flavorful beef patty. And those who might say The Grubstake is too greasy obviously haven't been stumblingly drunk in the vicinity of Polk Street in the wee hours of a Sunday and desperately needed some of that fatty goodness to soak up their mistakes. 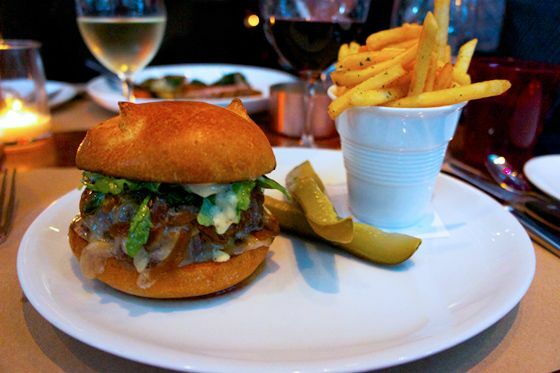 The off-menu burger at Heirloom is no secret, and wasn't ever really. Servers generally list it as a special each night, in fact. To make it more wine-friendly for this wine-focused restaurant, the beef is mixed with mildly stinky Epoisses cheese, making it extra-good with a lean French red. 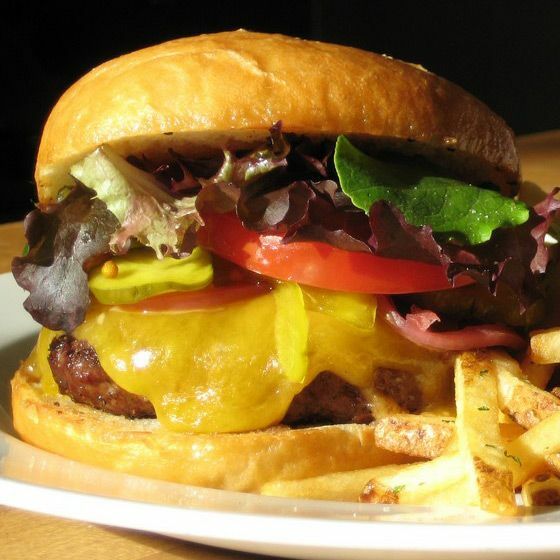 It's an incredibly juicy, flavorful burger that taste redolently of the cheese, and less of the beef, but for that reason it's one of the most unique burgers in town. 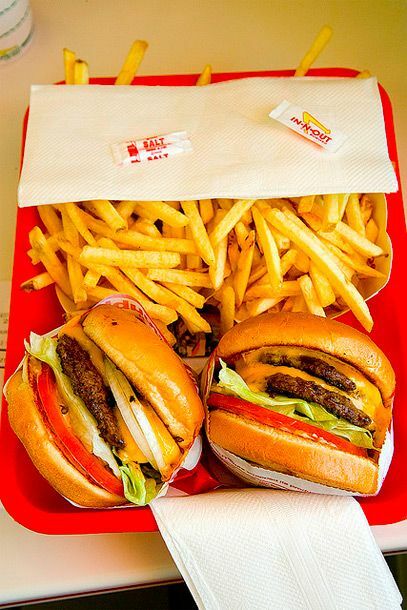 It doesn't get more classic than In-N-Out (or cheap! 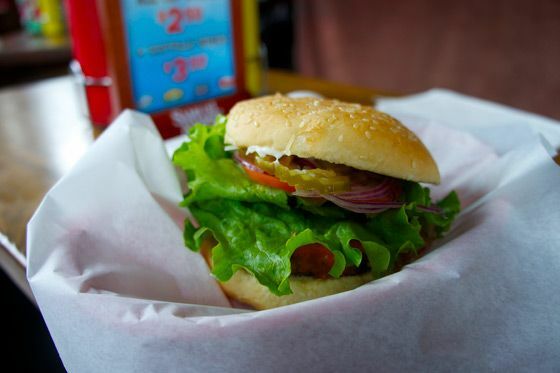 ), and the taste of this burger still gets us across town to Fisherman's Wharf every so often. The bun is sweet and soft, the meat just fatty enough and full of flavor, and for us it's a Double-Double Animal Style all the way. 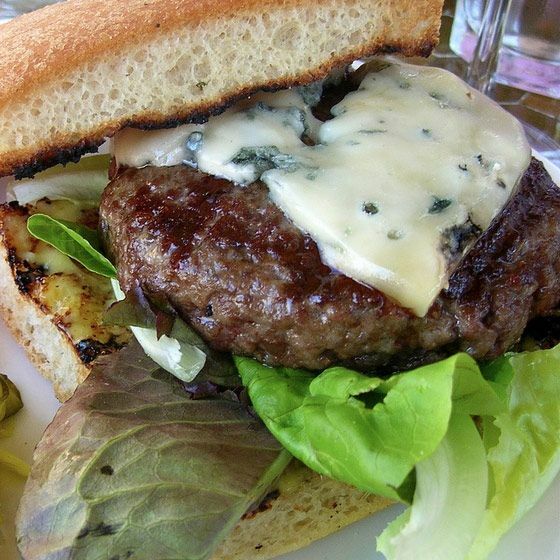 Easily in our top five in town is the J Burger at Jasper's, which gets its tastiness from a Lucky Dog Ranch American wagyu patty, and a topping mix of Shropshire blue cheese, a bacon-onion marmelade, and a well-dressed helping of frisée that some might call froofy but we're just fine with. It's a burger with a serious flavor wollop, but it never feels like too much of a good thing. 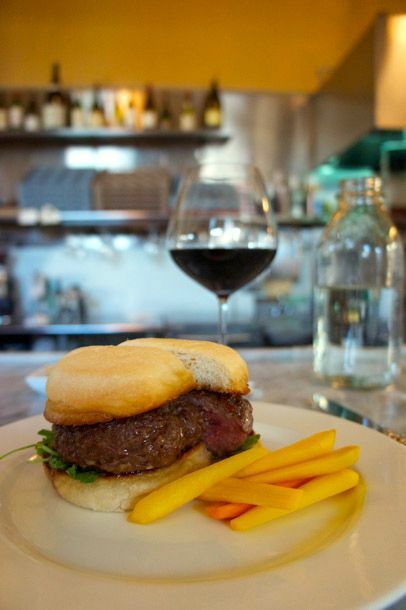 To be certain, Lark Creek Steak makes a gourmet burger. The beef is a blend of house-ground ribeye, New York steak, and filet mignon, and it's grilled over a wood grill for added smokiness. 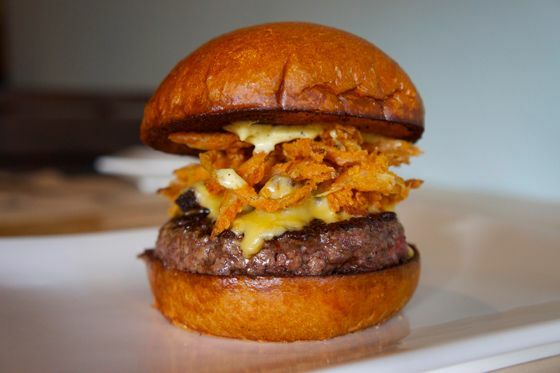 The Cowboy Steakburger (pictured) comes topped with Tillamook cheddar, BBQ sauce, crispy fried onions, and applewood-smoked bacon, and bares some similarity to Umami Burger's Manly Burger (read on for that one). 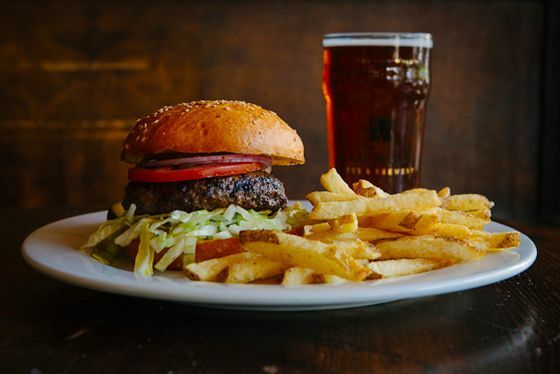 Magnolia's burger, made from dry-aged, organic Prather Ranch beef, has been a mega-popular staple at this Upper Haight pub since it opened. 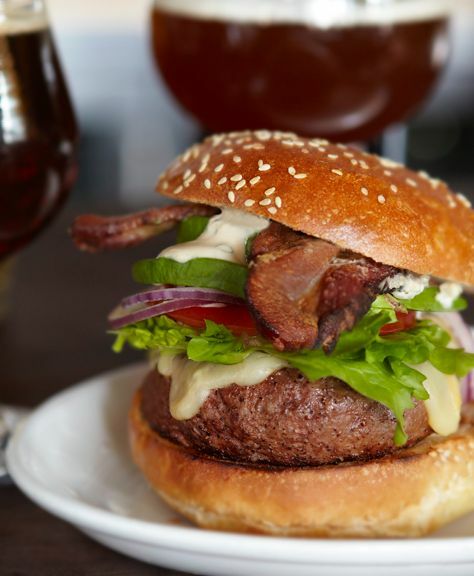 There are few things that go so well with beer as well-made burger like this one. 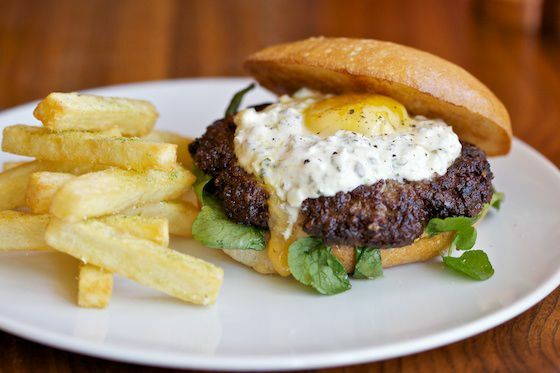 The Marlowe Burger helped put the restaurant on the map in 2010, with Michael Bauer immediately raving about its flavor — thanks to a mix of lamb and beef and a liberal smear of horseradish aioli — and causing a stampede to the tiny SoMa spot. The success of Marlowe helped propel partners Anna Weinberg and chef Jennifer Puccio to expand to North Beach last year with Park Tavern, where the burger's also on the menu and just as good. 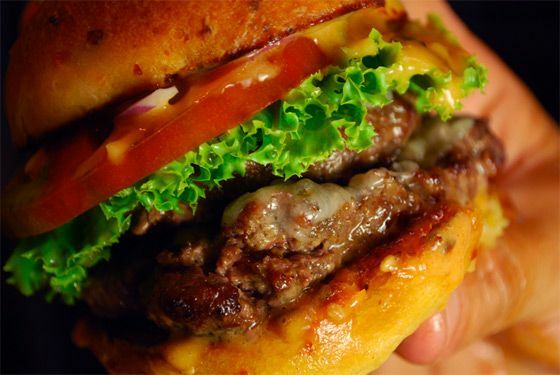 The key to this burger's awesome punch of flavor: Angostura bitters. We credit chef David Kurtz with that move (though it's been floating around in recipes for years), since we ourselves never paid attention to the label on the bottle that suggested adding the stuff to meat. The only other help it gets is from Munster cheese and some nicely caramelized onions. Also in our top five. 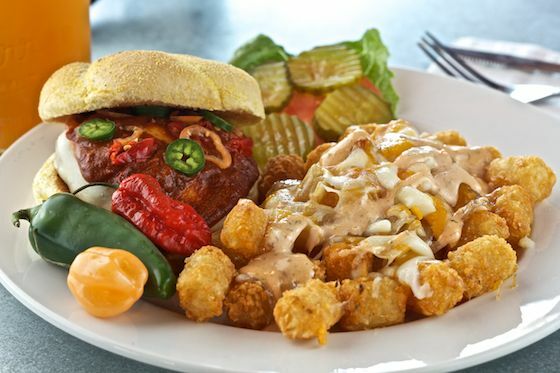 Maverick's Bacon Buttter Burger hit the scene last year and lives on on the brunch menu now. It's kind of an isane concoction using Myer Ranch chuck that's ground in-house along with sticks of cold butter, creating a true gut-bomb that you shouldn't tell your doctor about. It's topped with a spicy aioli, cheddar cheese, an (optional) egg, and a bacon-pepper marmelade. Back when they were operating Mission Burger out of Duc Loi Supermarket, friends Anthony Myint and Danny Bowien (who's gone on to great success with Mission Chinese Food) got real food-nerdy and tried to replicate the "granulated" patty-making technique invented by British chef Heston Blumenthal. Basically, they took strands of ground beef and created a big cylinder, then sliced it into thick patties (see the labor-intensive step-by-step here). That well loved, well seasoned "delicacy" of a burger returned this year at Mission Bowling Club, topped with caper aioli, and it was about time. This is a tried-and-true, old-school, working-man's hamburger with no frills, and no farm name attached, but it's still damn delicious and requires at least four napkins. They use house-aged, Angus center-cut chuck. Nothing fancy. 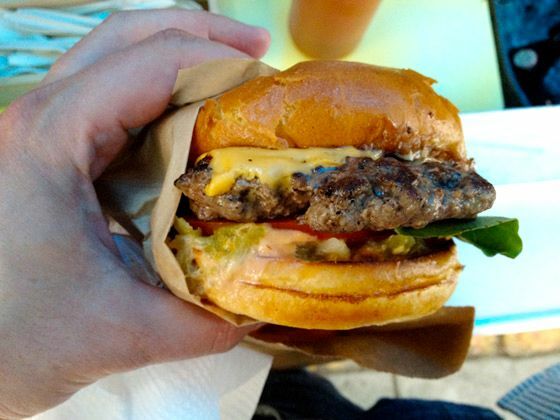 And it's been a favorite burger in North Beach for decades now, so why mess with the formula. 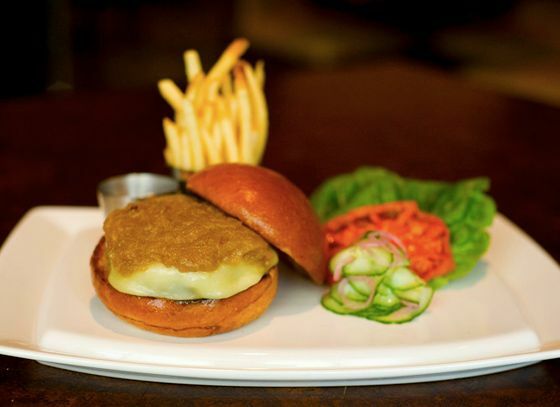 The burger at Namu Gaji, available at dinner and topped with mildly spicy kimchee relish, is made from an eight-ounce Marin Sun Farms patty, and it's too good to share. You can optionally top it with an egg, and/or cheese, and we can't recommend it enough. 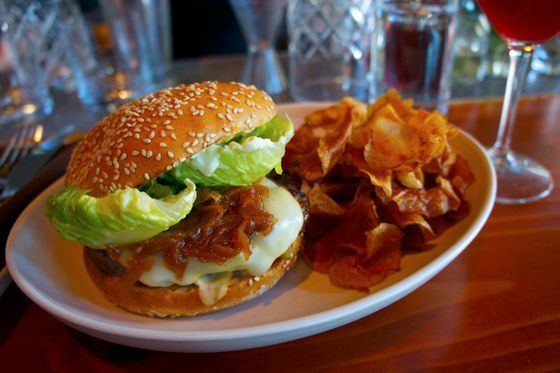 One of the shining stars among the city's restaurant burgers, Nopa's straightforward, grass-fed burger gets some extra complexity from the well-spiced pickled onions that sit atop it, and the house-made ketchup that's served with it — both of which help cut through the richness of the meat. Also, they make some mean fries. 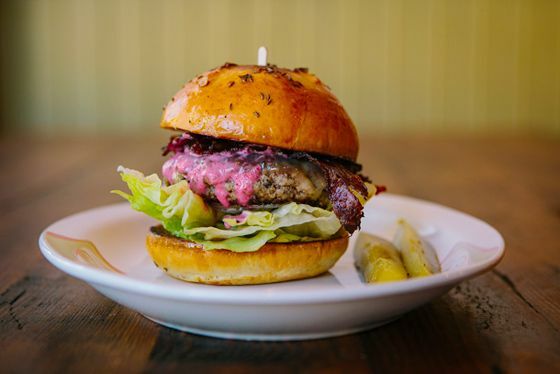 Last year, L.A. chef Susan Feniger called out the Spicy Sly burger at Pearl's (pictured) as one of her favorite things in San Francisco because it was so "gooey." 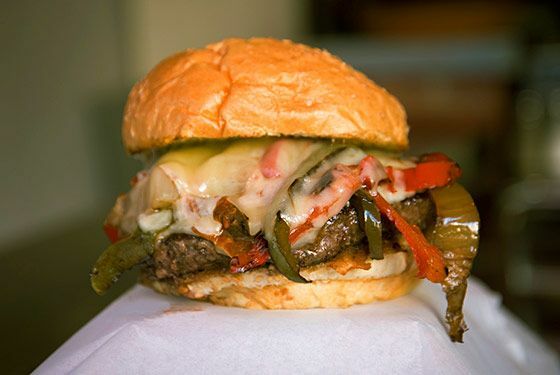 It's a messy, spicy, indulgent burger topped with peppers and onions, Jack cheese, mayo, and some Mexican spice via owner Sylvia Park's signature Spicy Sly sauce, made with habaneros and pumpkin seeds. 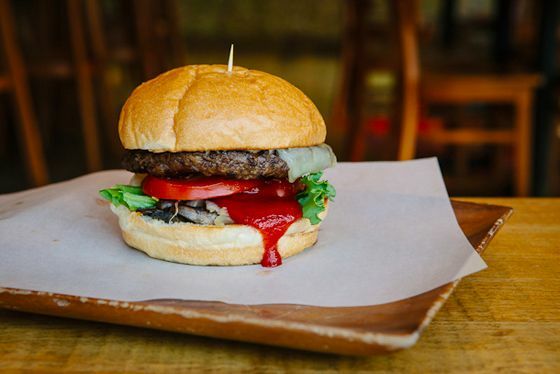 Since adding a second location down at Sixth and Market last year, the Spicy Sly burger has been reaching a whole new audience, and staining their shirts in the process. 708 Post Street and 1001 Market Street; $5.99 for 1/4 lb., or $8.99 for a 1/2 lb. Another top contender, and the newest one in our top five, is this excellent burger from chef Ron Boyd at Plum Bar in Oakland. It's a juicy, well textured, hand-ground grass-fed patty with excellent flavor on its own, but it's pushed over the top by a fluffy brioche bun, caramelized onions, cheddar cheese, and house-made pickles. All told, we will admit, it made us foodgasm. 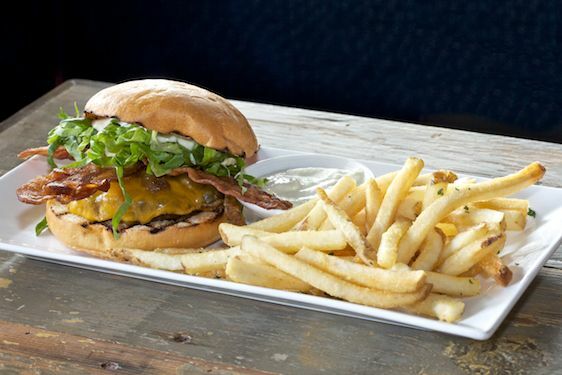 The popular burger at Traci Des Jardins ballpark Public House is made with Marin Sun Farms grass-fed beef, and topped with the simple but sufficient combination of bacon, avocado, and cheddar. It technically may not be available inside the ballpark, but you can grab one and take it inside to a game, and we'd wager it would beat out the majority of our nation's baseball-stadium burgers. The modestly proportioned burger at Prospect is part of their bar menu, and comes wtih a liberal amount of cheddar, special sauce, and pickles. Unlike most restaurants where bacon is the standard, the optional topping on this burger is fried pork belly, for a mere dollar extra. 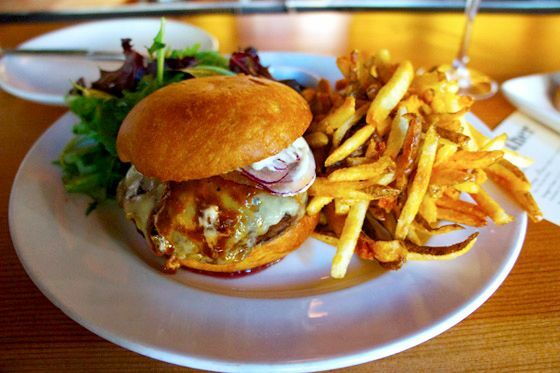 Another excellent newcomer to the burger canon of S.F. is this excellent burger that gets a few of its tastier details from some tried-and-true French technique. It's a blend of four cuts of beef — Wagyu brisket from Snake River Farms, hanger steak, short rib and chuck — giving it a wildly rich flavor, particularly from the brisket. Then chef Jason Berthold cooks the burger in a well-seasoned cast iron pan that also gets touched by thyme and garlic, giving the crust an added, subtle boost of aromatics. 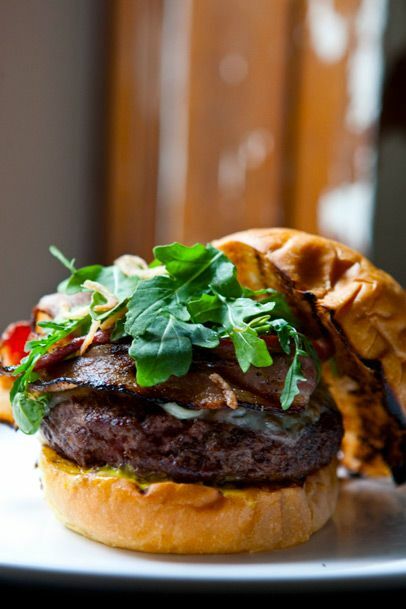 It's topped with arugula, a dollop of black-pepper aioli, and an onion marmalade seasoned with aged Banyuls vinegar. The only drawback: It's only available on the lunch menu. Yes, those are, indeed, tortilla chips on there. This is called the Tejano burger, and some may balk at its accoutrements. But Roam Artisan Burgers does an excellent job in the burger arts, and we even like this slightly unweildy concoction for the added, surprising crunch — kind of like adding Fritos to a grilled cheese. They use Pacific Pastures grass-fed beef, fresh avocado, tomato, jalapeno relish, and pepper Jack to garnish this one, and it is good. The juicy, dry-aged Prather Ranch burger has long been a draw at Serpentine and their older sister restaurant, Slow Club, on the Mission-Potrero border. It's a big one, a two-hander, served with aioli, arugula, pickled onions, and your choice of cheese, and many a Dogpatch denizen has gotten through the San Francisco winter (also, summer) by looking forward to a few of these. The Show Burger from the team behind Foreign Cinema is straightforward, well made, and totally delicious. 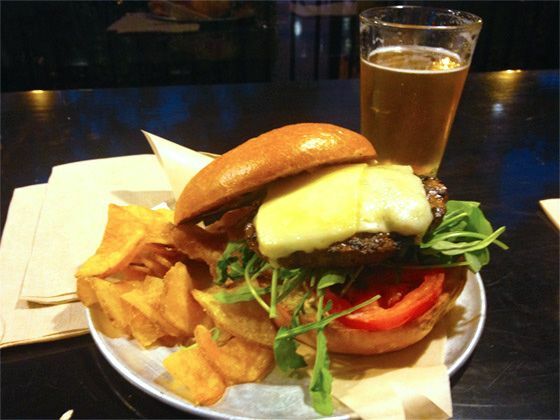 It's all-natural ground beef, topped with aged cheddar, arugula, and special sauce, and it all works. Also excellent are their house-made potato chips. 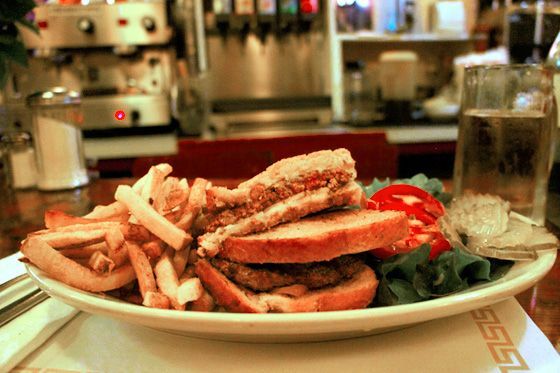 This is the only vegetarian/vegan burger that made our list. We realize this may not be fair, but neither is life, or love. And as we said a number of classics and under-ten-dollar standbys had to get culled from this list to make room for a few stellar newcomers. We made room for Source's unique, beet- and lentil-based, virtually "bloody" vegan burger because it truly does stand up to the big boys with actual cow in them. Even Patty Unterman was fooled by it, saying it has "look, heft and savoriness of the best beef burger." 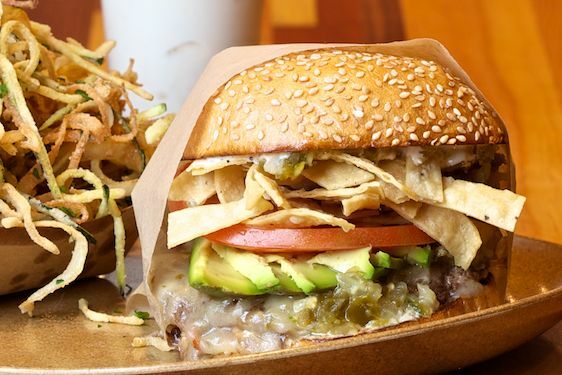 The chile-rubbed house burger at this new Mission beer garden/hall is a fine and satisfying one, topped with just pickled onions and optional cheese. An added bonus: sage fries, which we highly recommend. Also recommended: Several of their house beers to wash it down. 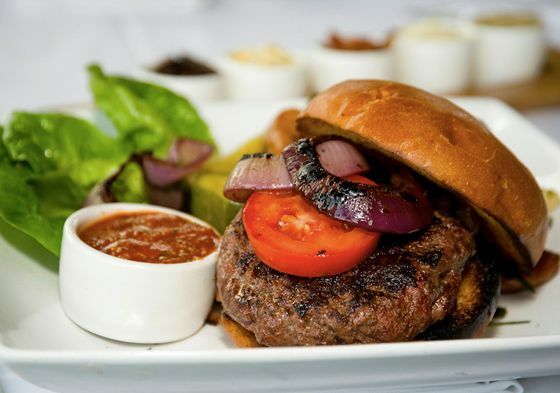 The English muffin burger has become a signature at Spruce, and having one at the bar is one of the only things that the 99% can afford to do in this restaurant on any average day. It's a modest eight-ouncer using Niman Ranch beef, and one unique accompaniment has always been the pickled zucchini alongside the pickled onions. Have it with an expensive Bordeaux, and you will feel like you've arrived. 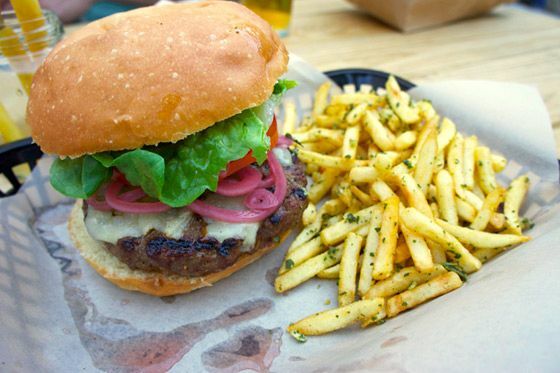 Chef Adam Timney also opts for Prather Ranch beef for his popular, always well cooked burger at this Castro spot, which comes with pickled onions, heirloom tomato, a nice grilled sesame bun, and some excellent French fries. It's got great beef and grill-smoke flavor, and you can also add on bacon, but it hardly needs it. This scrappy, growing local chain of burger joints from restaurateur Adriano Paganini (Beretta, Starbelly, Delarosa) makes an excellent and inexpensive burger, along the lines of Shake Shack in New York but with lines that are slightly less long. It's made with excellently fatty Niman Ranch chuck, and we do recommend ordering a double — the single patty, kind of like at In-N-Out, seems a little thin and lonely by itself. 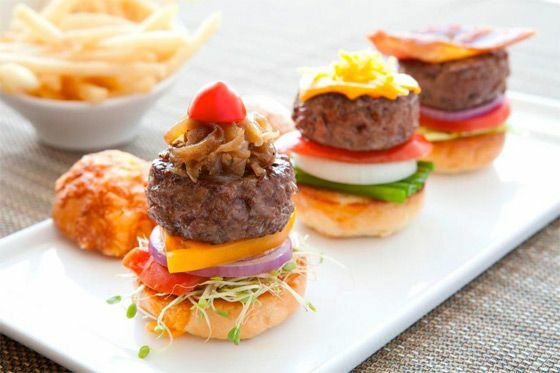 The dozen or so topping options also make this an always fun burger experience. 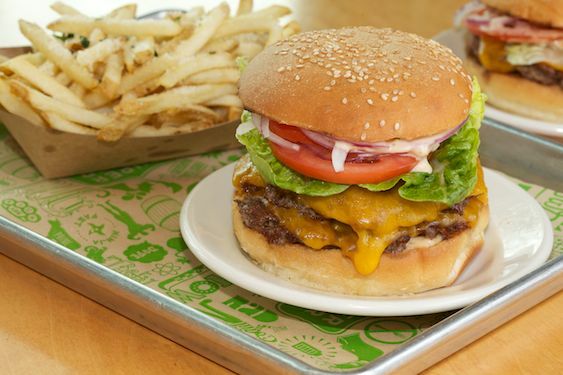 Doing the sort of classic, basic, all-American Shake-Shack-like thing in Oakland is TrueBurger, the two-year-old outfit from a pair of sous chefs who previously put in their time at places like Bay Wolf, Jardiniere, and Delfina. They're using Angus beef, cooking everything medium, and burgers come with just garlic mayo and American cheese unless you specify otherwise. And they are good, and a bargain at five bucks. 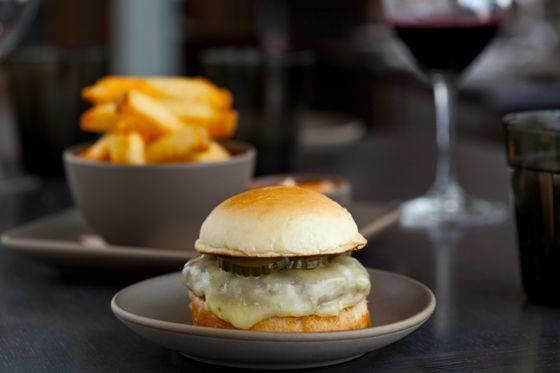 L.A.-based Umami Burger just debuted their first Bay Area location in the fall, on Union Street in Cow Hollow, and the burgers, we have to say, are pretty top notch. 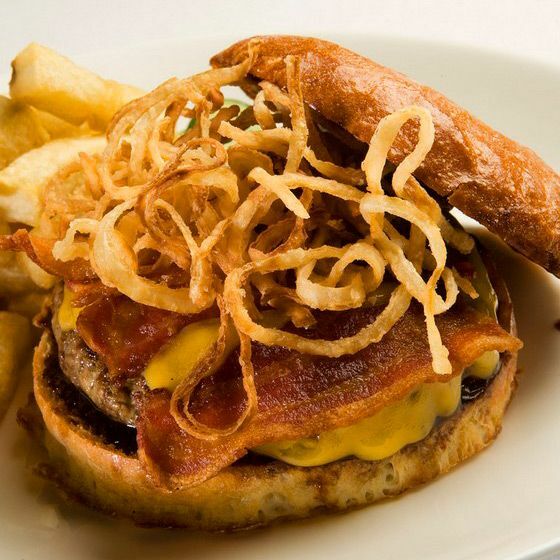 While these burgers still may not crack our top five, given some of the stellar options around town, we highly recommend the Manly Burger, topped with smoke-salted onion strings and beer-cheddar cheese. 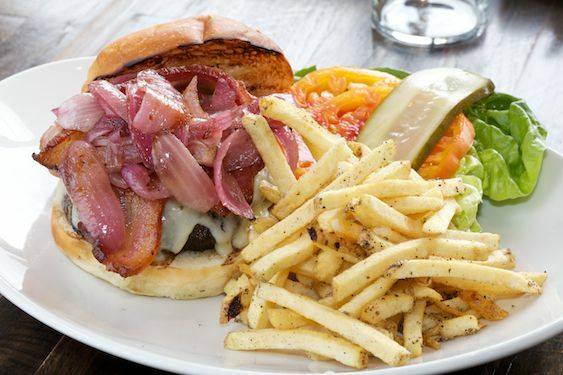 Wayfare's burger is definitely a big draw to the place, and it's made with a "proprietary grind" of grass-fed beef, and garnished with roasted onion, Marin brie, and smoked bacon. Trust us: Even though it's one of the pricier burgers on here, it's pretty worth it. Okay. We're not in love with eating a burger wrapped in a tortilla. But the rich blend of meat, the three cheeses, the heavy helping of tangy green chiles, and the side of chipotle ketchup all won us over. It may be more of fork affair, but we dig it. No S.F. burger compendium would be complete without this one, and it also helps us round out the alphabet. 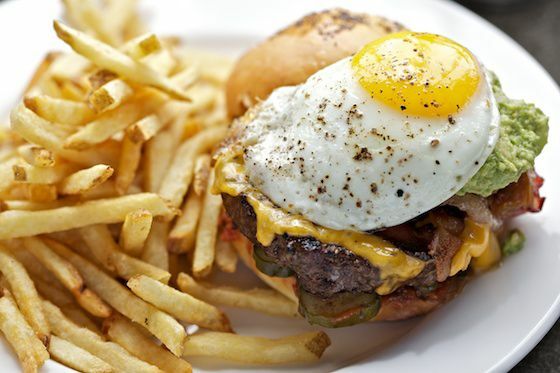 The burger on the brunch menu at Zuni has long been one of our hangover favorites, and it hasn't changed as the years go by. Say what you will about the focaccia, we like it. And the house-ground, grass-fed beef or house pickles never disappoint. A group argues there’s hidden poop in your poultry. The places to go for grand, old-style Parisian service, elaborate sauces (and flower arrangements), and puffy dessert soufflés. Massimo Bottura made the cut, too. Bonding with a total stranger over the world’s most perfect food. The Jewish soul-food staple was the inspiration for chef-baker Max Blachman-Gentile’s latest loaf. The bustling East Village social center has added evening hours, tasty new nighttime snacks, and some juicy wine on tap. The bakery chain is tweaking one of its most famous items. The NBA guard, and noted popcorn authority, ranks Barclays Center second on his popcorn power rankings. The karaoke dive is back in a new space on East Broadway with shiny red booths, a retro-looking mic, and an updated computerized karaoke system. Editor Peter Meehan on Jonathan Gold’s legacy, Lucky Peach‘s influence, and beefing with Bon Appétit. It’s our weekly ranking of the city’s most important restaurants. Greenwich Village open houses, a burlesque Alice in Wonderland, and Oklahoma! Miznon chef Eyal Shani gets philosophical with his latest project. Great food for less than $25, as selected by some experts. Get ready for tender meat, bitter broccoli rabe, sharp provolone, and ample use of pork drippings. Cafe Phin’s specialties include coconut coffee, which you’ll want to drink all summer.